There is something about feeling like you can do anything. Like the world is open to endless possibility. And you can be a player. This is how I feel at BIF. It’s magic. Sometimes it’s hard for me to explain exactly why I go to BIF – or how I fit in. I’m not a hard-core business professional. I don’t have a fancy title. I stopped at a bachelor’s. I’ve never invented anything. I’m not always up on the latest and greatest. What I’ve discovered at BIF is little me is enough. BIF isn’t about who’s who – it’s about breaking down silos, empowering each other, and coming together to learn, share, and uncover TOGETHER how maybe, just maybe, we can make the world better. When I’m at BIF something happens. I start to think of ways I can complement my writing visually. I decide to buy a sketchbook. I take notes trying to somehow keep the stories alive. I think about my kids. A lot. And how what I’m learning can influence them. I feel a wave of gratitude for BIF, the storytellers, and the amazing people I’m meeting. The energy is contagious, the content compelling, the stories life changing, and the people out of this world. Coming together with inspiring people at BIF is a true blessing. I love my work. I love people. And, I love a platform where the two are seamless. THANK YOU for allowing me the opportunity to attend and cover BIF8. There are many ways to change the world. BIF does it on a grand scale. They also do it one person – one little me – at a time. This little me is eternally grateful. As I am quick to share with many, writing is my passion – a true love. Writing comforts, empowers, and centers me. It lives in me, runs through me, and, I hope, touches others. In looking back on my life, I realize the writer in me emerged as a child. I can remember pairing up with my older brother John, breaking out the typewriter, and publishing a newspaper when I was probably six or seven years old. No kidding. Fast forward to high school, and I clearly recall writing as an outlet, penning everything from poems to love letters. But, I can’t help but wonder if I would have stayed the course, actually turning writing into a huge part of my career, had it not been for the influence of somebody. In retrospect that “somebody” turned out to be my 12th grade English teacher who I would not credit until this past summer, more than two decades after high school graduation. Let me shed light on my revelation: A few months ago, I was looking through my hope chest. I came across a composition book, opened it, and began to read. It was the journal from my senior year, in which my assignment was to write in for five minutes at the beginning of every class. I smiled as I read entrees about my Pop-Pop, babysitting, life in general, and so much more. To my surprise, I was flooded with memories and pride. 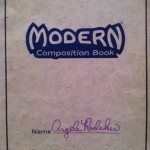 Then, I read comments written by my teacher and it hit me…I was already a writer back then. She recognized it, and she helped me discover it. She nurtured my gift. I instantly felt a sense of gratitude, followed by shame as I realized that I had never credited this teacher. As a matter of fact, truth be told, I didn’t consider her a very strong teacher. Wow, me, someone who dismisses standardized test and how we measure teachers today had failed to recognize that this teacher made a difference not by what she taught me academically but by how she encouraged me – how she gave me five minutes every day to develop my passion. Thank you, Mrs. Dodson. I hope you would be proud of me today for what I have done with my writing. I think you would be. I am happy to say that I do. I write. “Angela, I admire your feelings of warmth for your family and life in general. You seem to have a peacefulness about you, an ability to discover the good, the positive, the worthwhile around you. This is not a trait to be taken for granted – nurture your optimism (hopefully it will spread to some of those around you). I participated in a LIVESTRONG event in Austin, TX, nearly six weeks ago. I don’t think I’ve gone a day since without reflecting on my experience. First, there’s the obvious: The overwhelming gratitude I felt toward an organization that is confronting cancer in a big way. To witness the difference LIVESTRONG makes firsthand and to celebrate life in the company of survivors was simply awesome. I will hold steadfastly to my memories of seeing two beautiful bald women embrace each other for the first time, of witnessing cyclists raise their arms in victory as they crossed the finish, and of sharing in conversation with Alyssa, Renee, Doug, and others whose spirits alone lend credence to a cancer-free world. The weekend was everything I hoped for and more. LIVESTRONG not only bleeds yellow but also paints the world yellow with hope. There’s a lot we can learn from LIVESTRONG, including how to live, work, and brand strong.